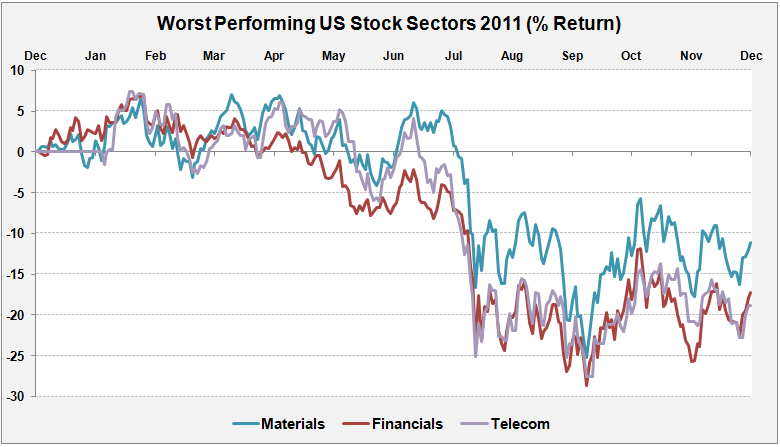 This article provides a snapshot of the best- and worst-performing US stock sectors in 2011. The classic defensive sectors — Utilities, Consumer Staples and Health Care — started the year on a positive note, began outperforming following the market’s February decline, and assumed full market leadership after the August market meltdown. 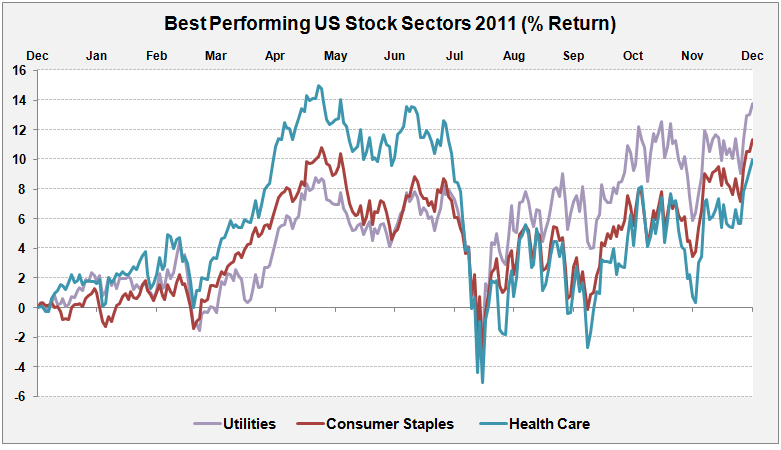 These sectors ended the year with total returns of 13%, 11% and 10%, respectively. 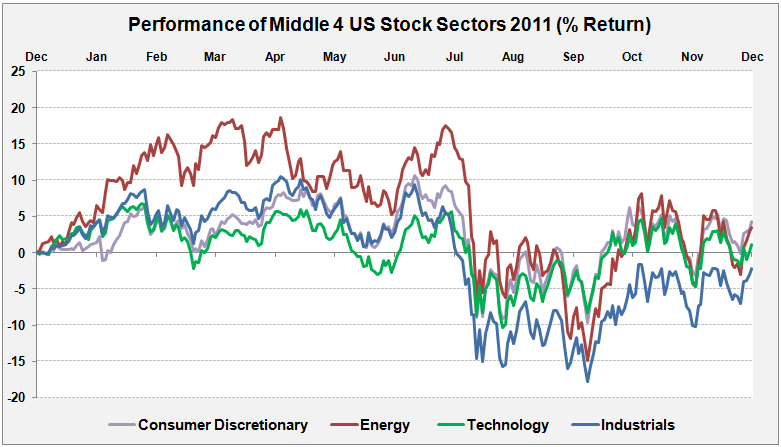 Tightly-packed around mediocrity, with returns ranging from +4% to -2%, were the Consumer Discretionary, Energy, Technology and Industrial sectors. These sectors are the ones that would be expected to lead in a more vigorous economic expansion, which was conspicuously absent after being widely-touted by most pundits early in 2011. The graph below shows how these sectors led the way early in the year, but were eventually overtaken by the classic defensive sectors. And, rounding out the field with total returns ranging from -11% to -18%, were the Telecom, Financial and Materials sectors, battered by competition, malfeasance and incompetence, and an abrupt shift to “risk-off” mode following the August meltdown, respectively. After publishing an analysis of the Conference Board’s Economic Indicators and 2012 Economic Outlook later this week, I will opine on which sectors are likely to lead the way in early 2012. Stay tuned. In this post due to 3 graphs I got information the past of stock market and about present marketing. Thanks for sharing. in one other blog that regarded like this. How do you know all this stuff? Telecom has never been much of a defensive stock.